Form Description: One of the more difficult things about exercising is determining whether or not your performance is actually improving. If you don�t keep track of what you are doing, then you can easily make yourself think that you are doing worse, or better, than you really are. Solve that problem by using this Simple Exercise Log. It will allow you to keep track of your performance, while also allowing you to keep track of the goals that you are striving for. This simple form can really help you out in the long run. It can sometimes be confusing trying to keep track of what exercises you have done, and how you have improved over time. One way that you can make that whole process easier is with this particular edition of the exercise log, which has numbered lines. These numbered lines will allow you to more easily track, and later on reference, the information that you put into it. Definitely a huge help when you are looking to find a pattern in your performance. Furthermore, this particular edition of the Simple Exercise Log has been created with extra wide rows. This extra space allows you an easier time of entering the information in by hand. After all, not very many people will actually perform their exercise regimen with the computer on hand. 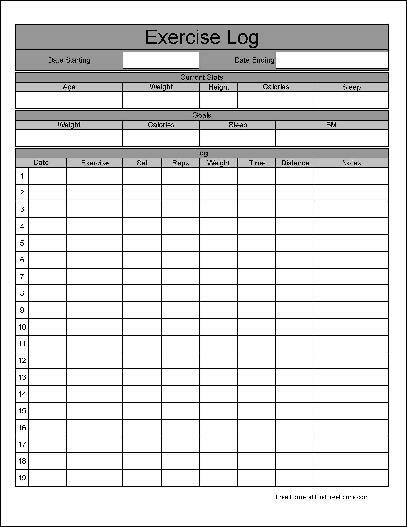 Instead, simply print out a copy of this form, and you will have a wonderful working copy that you can use while you are working out. Simply transfer the information over to the computer later to ensure that you don�t lose any information. This form ("Wide Numbered Row Simple Exercise Log") is associated with the following keywords: Exercise, simple, log, tracking, cardio, weights, basic, numbered row, wide row.